The perfect start to your DIY collection. 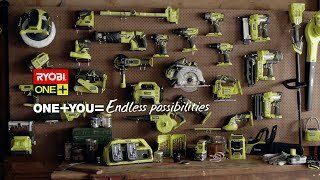 The 18V ONE+ 2-piece kit from RYOBI is a great way to get into the ONE+ system, with over 70 tools in the range. Featuring a drill driver and an impact driver plus 2 x 4.0Ah battery and a 2A charger, this kit has everything you need to become a dedicated DIYer. And it all comes with a nylon bag for safe storage and transportation, so you can take your kit anywhere you go. Ideal for tackling all those household handy jobs like hanging pictures, assembling furniture and general repairs, you'll love how quickly you can move from job to job with these versatile tools. The ONE+ range is designed to let you make the most of cordless convenience while taking advantage of a universal battery platform that's compatible with more than 70 power tools. This means great value as you add to your collection of tools and hardware. Get the RYOBI 18V ONE+ 2-Piece Kit from your local Bunnings Warehouse.